Based upon the classic film, The Invisible Man is a five reel and three row slot game with 20 pre-set paylines, a win both ways feature and a theoretical return to player percentage of 96.4%. 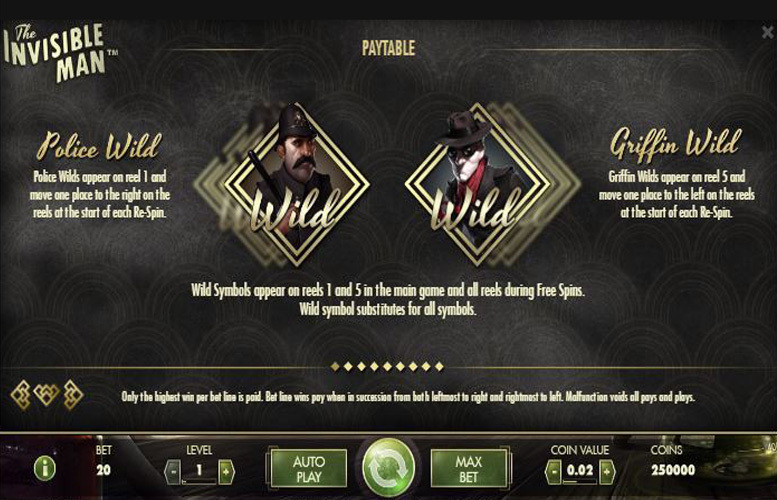 The game can be played at one of ten different bet levels, one of six coin values and includes wild substitutions, re-spins, free spins and two bonus features. One of a number of slots themed around classic movies, The Invisible Man is a game which many online gaming fans will enjoy. Our full review aims to give you as much information about the slot as possible and will cover its top jackpot, special symbols, paytable and betting limits. 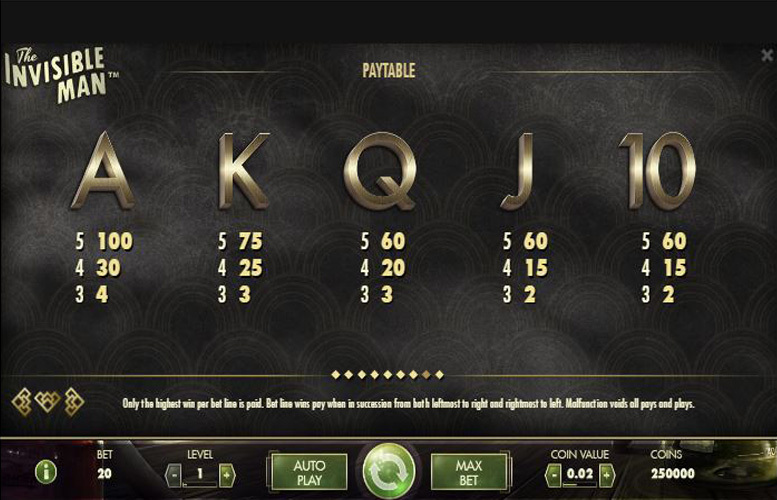 The bonus features of The Invisible Man give players a number of ways to win big money, but the slot’s main game works in a traditional manner. Players win jackpots based on combinations of symbols which line up along the game’s 20 pre-set paylines, and the most valuable combination is made up of five of the Flora Cranley symbols. Five of those symbols along a payline results in a payline jackpot of 500 times the bet level, which means a maximum possible 5000 coins at the top bet level of ten. If the combination were to appear on all 20 paylines, therefore, that would result in a top jackpot of 200,000 coins due to the game’s win both ways feature. With a maximum possible coin value of 50p, the top jackpot can therefore be worth a total of £100,000. There are actually only two types of special symbol in The Invisible Man but they are both involved in awarding re-spins and free spins and in triggering the game’s two bonus features. The symbols are both wilds and when they appear on the reels they shift one space horizontally after winnings have been awarded to trigger a re-spin, and are therefore known as ‘Walking Wilds’. Wild Symbol – the first type of ‘Walking Wild’ is called the Police Wild and the second is called the Griffin Wild. Police Wilds appear on reel one and walk one place to their right, whilst Griffin Wilds appear on reel five and walk one space to their left. If one of each type of wild reaches the same space on the reels, they merge together and activate ten free spins. Up to 30 free spins can be activated at any one time and during free spins, both types of wild can appear on any of the reels. If wilds merge during free spins, an additional four free spins are added to those which the player has already been awarded. While free spins are ongoing two meters appear within the game and each is linked toone of the two types of wild. As a wild symbol moves off the reels during free spins, it fills a space within the corresponding meter and when either of the meters has had all of its eight spaces filled its, bonus feature is activated. The two possible bonus features are known as the Griffin’s Rage Bonus Game and Police Spins, and if either is activated it will start after free spins are completed. The bonus game involves players clicking to choose between five different items in three separate locations. The items could either result in coin wins, an increased multiplier or the end of that stage of the game. All coin wins achieved are multiplied by the accrued multiplier at the conclusion of the third stage of the game. Police Spins are three spins where five Burning Wilds are randomly placed upon the reels to increase winning opportunities. The maximum possible win from the bonus game equals 37,600 coins whilst the maximum jackpot from Police Spins equals 270,000 coins (90,000 per spin). The most valuable symbols on the paytable of The Invisible Man are the symbols depicting named characters from the story. The most lucrative symbol of all is that showing the character called Flora Cranley and five of those symbols along a payline pays out at a rate of 500 times the bet level. If the maximum bet level of ten is set, that can result in a jackpot of 10,000 coins (5,000 x 2 due to the win both ways feature). If the combination appears on all 20 paylines, therefore, that results in the top overall jackpot of 200,000 coins. The next most valuable symbol in the game is the Arthur Kemp symbol and that pays at a rate of 400 times the bet level, which in the same way can result in an overall top payout of 160,000 coins. The Invisible Man is always played with 20 paylines and the win both ways feature activated, but players have complete control over both the coin value and bet level for any spin. Choosing a bet level from 1-10 determines how many coins are staked per payline and setting a coin value determines how much each coin is worth. The minimum possible stake per spin, therefore, is a total of 20p and can be set by choosing a bet level of one coin per payline and a coin value of 1p. The maximum possible stake is £100 and is achieved by choosing ten coins per payline at a value of 50p. The Invisible Man is a game which ticks a lot of boxes when it comes to what players are looking for from a game. Players who are focussed upon jackpot size and generosity will find the top main game jackpot of 200,000 coins to be very rewarding. What’s more, the slot’s two bonus features also introduce further ways to win considerable amounts of money. Those players more interested in gameplay and how fun and immersive it is won’t be disappointed either. 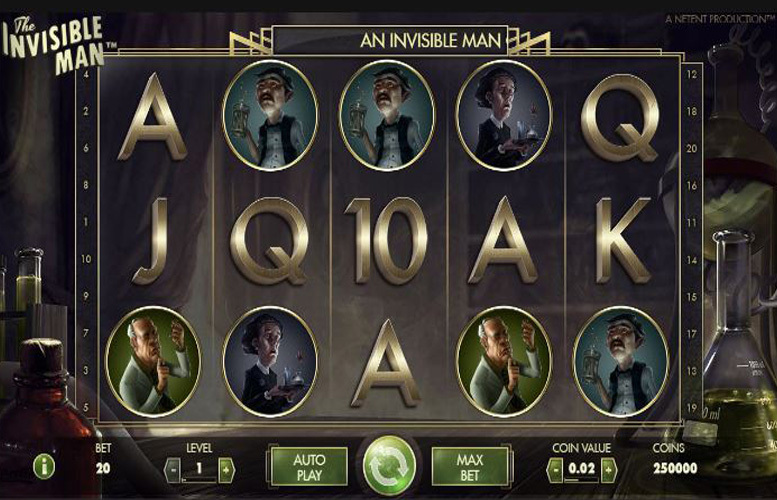 The main The Invisible Man game benefits from a win both ways feature and innovative walking wilds which trigger re-spins, free spins and the slot’s two separate bonus features to keep things interesting. 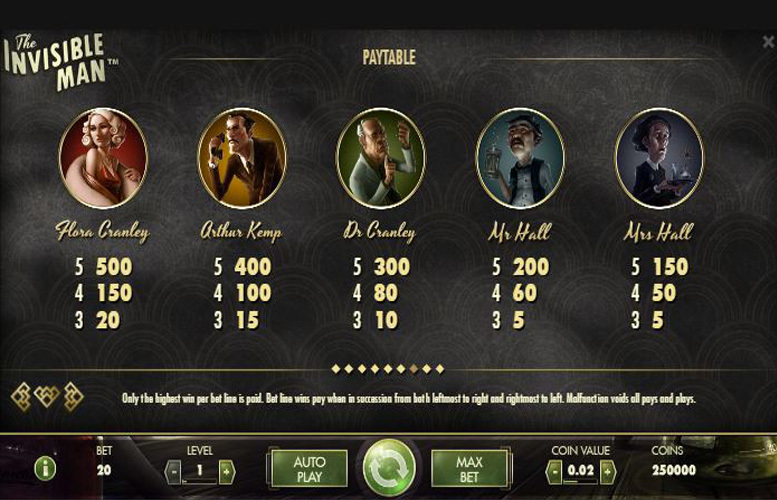 Add to those advantages, the fact that the game also has a fun theme and offers excellent control over betting amounts and the only conclusion you can come to, is that The Invisible Man is a great slot game option. This game has a rating of 4 / 5 with 632 total reviews by the users.